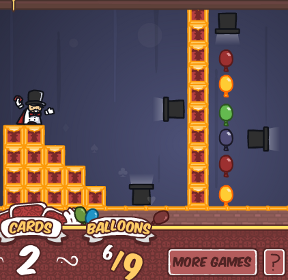 Flash Chaz and Marsh Games serve up their own adorable, quirky spin on some Bloons-style projectile puzzles with The Great Bazooki, a balloon-bursting game where you play a flashy magician whose claim to fame is some truly stupendous card throwing. Your job is to impress your discerning clientele by popping all the balloons on each stage with a limited number of cards... just click to throw and use the projected path as a guide to help aim. As the stages get more elaborate (what's a magic show without whirling saw blades? ), you'll have to teleport around the stage to get the best angle, as well as master your timing to see your cards don't get burnt, sliced, or otherwise destroyed before you have a chance to finish your show. Don't let the first few stages fool you. Though The Great Bazooki initially seems almost too Bloons-y, before long the game begins introducing a multitude of new magical elements to keep things fresh. How about magic teleporting hats, complete with pesky rabbits? Locked chests with floating keys? Fans, rings of fire, guillotines, and more? Whisk all that up with a gorgeously charming cartoon style and a silly sense of humour, and you have a simple yet fun game that brings a fresh new look and feel to a familiar concept. It's a shame the game loses the storytelling aspect for the most part after the beginning since it would have been the cherry on top. As it is, though it doesn't really shake up the formula it draws from enough to be groundbreaking, it is a fun challenge, and one with a lovely style to boot. I don't know who the makers expected to impress with such an unhappy ending, though. Ourselves, of course! :-) Lots of people are talking about this ending, which makes it more interesting than a "happy ever after" that nobody would ever mention.